Hope you didn’t miss either of these two exhibitions which both just closed this past Saturday (along with the Gordon Matta-Clark at David Zwirner)! I have been looking at MORE art lately (not workin’ and all…). Piecing things together in my mind. Making connections where they may or may not exist but somehow make sense. Somewhat like the Gordon Matta-Clark in the previous post, I realized that his work made more sense to me after I saw Louise Nevelson, at the Jewish Museum. So I wondered, and wandered around Chelsea (on a mission to see work before exhibition closings), weaving in and out of galleries. 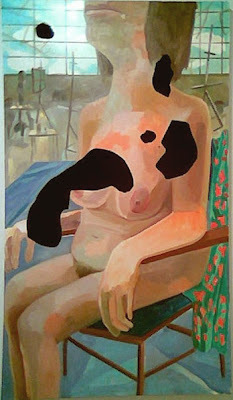 My main focus was to see the work of Dana Schutz at Zack Feurer Gallery. There is quite a buzz around Dana’s work. I still remember the first time I witnessed one of her paintings at the Venice Biennale in 2003. I remember leaning into the canvas, letting the strange shapes and colors that somehow, formed this narrative jungle, wash over me. So when I read Karen Rosenberg’s review of the exhibiton and mention of “Mona” featuring Dana’s take on the Mona Lisa, her head shown at a 90 degree angled, back view, I was driven to see the piece in person. But I also made a stop at the Esso Gallery, “Arte Povera Now and Then”. 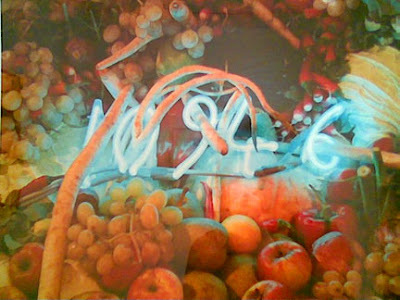 And looking at a photo by Paolo Pellion of a Mario Merz installation with the fibonacci numbers amidst fruit, (below) and myself inside the mirror of Michelangelo Pistolettos’ “Coniglio Appeso (hanged rabbit)” I found connections. 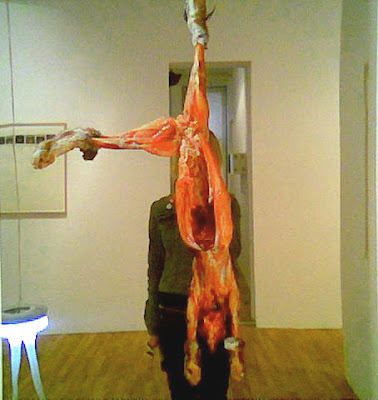 Whether the connections relate direct to Arte Povera and Dana’s work, I doubt it. But I think the connection is what is pulsing through me and the netted filters that exist behind my eyes. Where color meets form meets shape, things are born. They emerge as infants and are personal copies of ourselves. Sometimes imperfect, but as art, almost always right.